2. Cut the onion into small chunks. Leaving the skin on, slice the orange into 8 wedges, leaving the skin on. Roughly chop the parsley. 3. In a bowl mix the piri piri seasoning and dried oregano with a pinch of sea salt and 1 tbsp oil. Place the chicken thighs in this bowl and coat evenly. 4. Place the chicken in an ovenproof dish (or on a baking tray), alongside the onion and orange wedges and drizzle with 1/2 tbsp oil. Place in the oven for 20-25 mins until the chicken is cooked through. After 10 mins of cooking, add the cherry tomatoes to the ovenproof dish and place back in the oven for the remaining cooking time. 5. Meanwhile, boil a kettle. Rinse the quinoa and add to a saucepan with 300ml boiling water and a pinch of sea salt. Simmer for 15 mins until cooked. 6. Drain the quinoa and stir through the cherry tomatoes, roasted onion, parsley and rocket. Season with black pepper. 7. 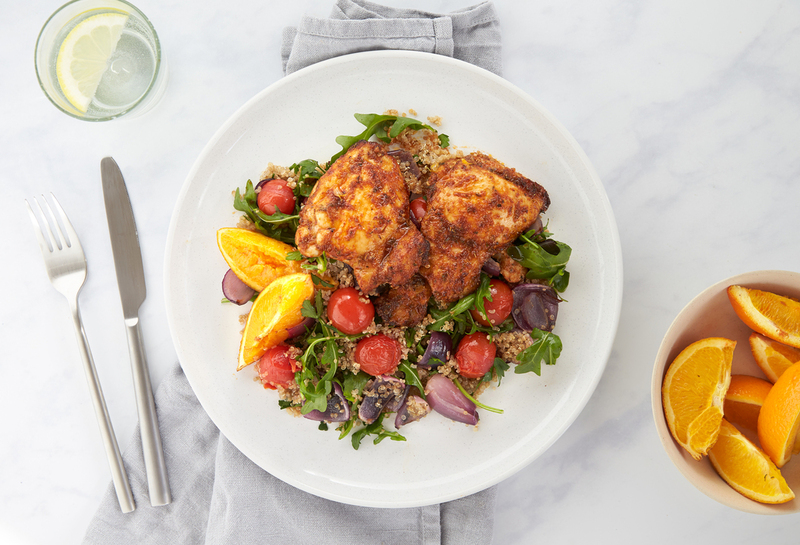 Serve the chicken thighs on two warm plates, alongside the vegetable quinoa. Squeeze over the juice from the roasted orange wedges.